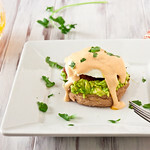 When we posted the Avocado Eggs Benedict recipe, I mentioned that one of the pieces were missing: Chipotle Hollandaise Sauce. I had everything ready to go to whip up a batch. Everything except the star ingredient – canned chipotles. It’s an absolutely delicious meal without it but it’s so much better with the sauce. To remedy that sad situation, we whipped up another round of Avocado Eggs Benedict, this time with Chipotle Hollandaise. It’s slightly spicy but the subtle warmth pairs perfectly with the creamy avocado and the richness of the egg yolk. 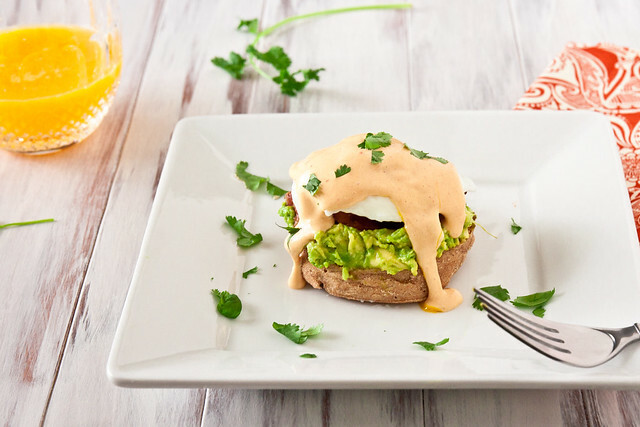 Creamy chipotle hollandaise sauce is the perfect way to warm up Avocado Eggs Benedict. Place egg yolks, lemon, salt, chipotle and adobo sauce in the blender. Hello! I am always so impressed with your photos. Do you think you could do a post showing the set-up of a shot? I’d love to see where these beautiful pictures were taken and if you use any props to help with your lighting. Thanks, Lauren! Sure, we’ll try to work on something like that in the next week or so. Sweet! I’m looking forward to it. Mmmmm. Great idea! Something I do with my chipotles in adobo is whirl a canful in my mini-processor, then drop the resulting mixture by teaspoonfuls onto a cookie sheet and freeze. Once set, place the drops into a freezer bag and pull out what you need when you have a need. Alright you little tricksters! You have now made me want breakfast for dinner. And not just any breakfast, this breakfast. That avocado is killing me! I almost died when I saw this. Avocado? Poached egg? Chipotle hollandaise? I CAN’T WAIT to make this! All I can say is.. WOW, WOW. Incredible idea and combinations!! Every time I go out for breakfast I get the eggs benedict. I’ve tried it in all shapes and sizes, but I have never had it with chipotle sauce. I’m going to have to make this at home and give it a try. Can’t wait!! What an amazing idea!!! I adore hollandaise sauce – to kick it up with spiciness is brilliant. Last time I made hollandaise it ended up like bad scrambled eggs. This recipe inspires me to try again. If I fail, the dog will have a spicy addition to his kibble! I just made this and it was a hit! I have some extra sauce was wondering how long this will keep in the fridge? ~4 days or so. It never *actually* lasts that long around here, but it’s still good on day 3 for sure. You can reheat it on reduced power in 10 second bursts. I love anything avocado, and I love anything chipotle! One question: Is it possible to briefly heat/whisk the sauce over a low heat/double boiler, just to raise the temperature of the egg yolks more? Sure! I vote double boiler so you don’t get cooked pieces of egg in the sauce. Had something similar at a local restaurant and had to find a recipe. This is just as good as what I had there. I’ve made this twice now. The chipotles were a little large so the second time around I just used half of one and and a teaspoon of adobo sauce. Excellent combo and will definitely keep making this. Thanks for sharing. Loved this! My “benedict” consisted of homemade biscuits (slightly misshapen), sausage patty and egg. This was my first attempt at hollandaise and it was amazing with the addition of chipotle. Next time I will use the avocado as well. I keep my opened chipotle peppers from the can in a ziploc bag in the freezer. I break off chunks and add as needed. Will try this for Easter brunch today. Looks absolutely delicious!